Do You Visit The Old Geezer? Why Burn The Qur'an--That's Just Stupid! What Is Your Playground Personality? A Bit Of Country Right In Parma! The best bargain we ever got was our king sized purple bedspread from Sears. Years ago, we went to Sears looking for a bedspread and found one we liked but there was no price tag. We picked it up and asked the cashier how much it was. She looked all over and could not find a price for it either so just charged us $2.00! Gerard and I just looked at each other, smiled, and said we’ll take it! Then we hurried out of the store before she could change her mind. We have been very happy with it and hope she didn’t lose her job. Can you believe it? So, what was your best bargain ever? Here's a link to another related post about a bargain Gerard got: Who Says Men Can't Shop? This is in response to the prompt: "Describe A Time When You Saved Big" of Mama Kat’s Writer’s Workshop. According to our little survey on this blog, out of 24 people, only two preferred long posts (5 or more paragraphs). I really appreciate all who participated in this poll because I really wanted to know. I will try to keep my posts between 1-4 paragraphs most of the time. I also prefer shorter posts to long ones so glad to discover that I am not alone in this. Three to four paragraphs were most preferred by two votes. That's all folks! Hope you enjoyed this post! Karen didn’t always have an office job, not even a sitting job. My first job involved walking for two hours which was great when the weather was nice, but not so great in the winter. I had a cart that I loaded up with plastic bags containing ads and coupons that I hung on door knobs in my neighborhood once a week. This was a very long time ago and I don’t remember much about it, other than I didn’t do it for long and the pay was very low with no benefits. I remember my parents helping me stuff the bags which took about half an hour or so. It gave me an appreciation for mailmen and mailwomen. I understood why they cut across the yards instead of sticking to the sidewalk. Gerard got a warehouse job right out of high school and has stayed there ever since. He loads and unloads trucks, fills orders and sometimes has to pack if they are short-handed. He is on his feet all day and goes through about 6 pairs of tennis shoes per year. He likes that he gets to move around instead of sitting at a desk all day and that he can wear jeans, shorts or sweats and a t-shirt or sweatshirt to work if he wants. He gets paid every week and it’s been steady work for him over the years. In Africa, a respected Muslim theologian lived with his wife and daughter. While he was out of town, JESUS film team set up the movie and his wife and daughter watched from their courtyard. They were afraid to attend because of the man’s position, but the volume was loud enough for them to hear and both trusted Christ as their personal Savior. When the cleric returned, they told him what had happened. He was furious; he felt they had humiliated him and betrayed Allah. He decided to kill them both. This man sealed them inside their concrete-walled house, locking the strong doors and windows and leaving them without food or water. He told the neighbors that he and his family were going away and would not return for two weeks. Because of the great distance between the homes, he knew their cries for help would never be heard. The scholar scoffed and refused to believe. Suddenly, the hand appeared and offered him food and water as well. Severely shaken, he immediately went to a local Christian pastor in the community and told him what had happened. The pastor shared the gospel with him. He became convinced that Jesus was the true God, and he prayed to receive Christ. From p. 24 of The Power Of Jesus, used by permission from The JESUS Film Project®. I find it amazing that God kept that mother and daughter alive and that the Muslim leader also became a believer. I guess it would be pretty hard not to believe after seeing his wife and daughter still alive upon his return and seeing the mysterious hand offering food for himself. See, Allah and God are not the same. At Christian Mommy Writer I found out what aThumblebus is. Have you ever heard of it? It's a gutted school bus that has been filled with playground type things to amuse children. Thanks to Kristin-The Goat's comment on my "Why Do I Blog? Good Question" post, I learned that tons of people participate in National Blog Posting Month (NaBlPoMo) which is a challenge to write one blog post a day for a month and the official month for that is November. Over at Reading Teen I found a very funny video made by librarians called "Libraries Will Survive." I was going to embed it here but thought the Reading Teen should get the credit for it so just gave you the link. It's worth the visit. By reading Flight to Heaven by Capt. Dale Black,I learned that "Often people with head trauma may remember events, but they will not remember the faces of the people in the events. Another type of amnesia, called source amnesia, is when people can recall certain information, but they don't know where or how they obtained the information. Since different parts of the brain store different types of memories, the more pervasive the damage, the more types of memories are affected." Click here for more Friday Fragments or to link yours up. I have had a variety of jobs including door-to-door distribution, insurance policy typist, rater and underwriter, substitute teacher for grades 7-12, temporary jobs through an agency during summers when I was off from teaching, which is how I landed my current job as secretary at a law firm, by far the best! Getting paid twice a month. having health insurance (not all jobs do, you know). The regular hours, overtime is optional and when I leave at 5 p.m., I don’t have to think about it as opposed to being a teacher which was my original plan. Not having to go on business trips. The location near stores, the bank, fast food chains, and the library which I can go to at lunch or on my two 20-min. breaks. Having lots of personal time off with pay. Getting free tote bags, water bottles, food for different things throughout the year. Being able to get Club Seat Indians tickets for free if they aren’t being used by a client. 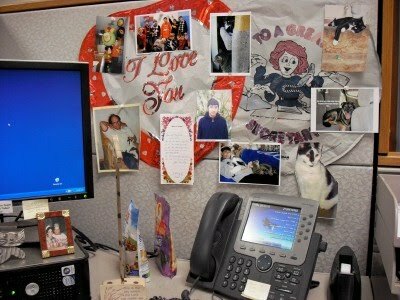 That I can put up pictures in my cubicle to personalize it. Assisting others which is basically the essence of being a secretary. In summary, as jobs go, mine is very good. The only thing that would make it better is if it was something I was passionate about. What job do you have and what do you like about it? This post is part of Mama Kat's Writer's Workshop to list 10 things you like about your job. Every week when we go grocery shopping, we load the bags in the back and I carry the fragile ones up front with me while Gerard drives. Invariably, at the first turn he makes, the bags topple over or shift. Not anymore! Gerard actually came up with a very good solution. No, not to take the turns slower, but to bring along some boxes to put the bags in when we load them. I can even trust the eggs and my salad to ride safely in the back unattended now. It works beautifully and also makes it easier to carry them inside when we unload. Great idea, honey! What good idea has your spouse come up with? We'd love to hear them! Immediately I thought of a blog recently discovered called “The Old Geezer Blog.” I think I found it through Saturday Samplings over at Half-Past Kissin’ Time. He is a Christian blogger who has his testimony posted via a link on his sidebar. Do you read sidebars on blogs? If not, you are missing out on some interesting things. His blog is very easy to read, uncluttered with interesting posts about general every day things that are thought provoking. I always enjoy his graphics that he includes in his posts too. He has over 1100 followers but still responds to comments I leave there. 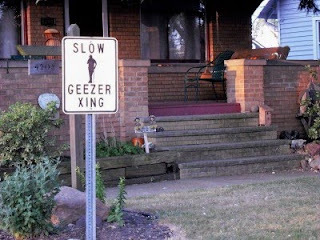 Stop by to visit The Old Geezer Blog if you get a chance. I’m sure you will enjoy your visit there and maybe add him to your blog roll or become a follower. Do you ever look at blog rolls on other blogs? Sometimes I do and have found some good ones that way. Also, if you like comments a good way is to read those comments left on other blogs and if someone leaves one you find interesting or amusing, visit their blog and leave a comment for them. Chances are they will visit you back. At least you know they leave comments. For many years, a couple served as missionaries to the Malto people of India without seeing a single person come to Christ. The husband and 3-yr.-old son died, the wife returned to the states feeling devastated, confused, and defeated. In an interview for the PLAIN DEALER, Eric Mangini, head coach of the Cleveland Browns, said his all-time favorite book is Season of Life by Jeffrey Marx. Both Gerard and I read this one too and liked it a lot! Click the link to see our review of it over at "Grab A Book From Our Stack." From a couple boys in my Sunday School class, I learned that snails help keep aquariums clean. When I asked if they had any pets, a couple mentioned a bunch of snails. I never realized snails were pets--I wonder if they name them all. Do you have any snails as pets? Suzanne Collins has all three of her trilogy books on USA TODAY'S best-selling books list: Mockingjay is #1, The Hunger Games is #8 and Catching Fire is #14! Quite an accomplishment, especially considering they are all fiction! We are still waiting to read Mockingjay but loved the other two. This post is Day 4 of The SITS Back To Blogging challenge as well as Mama Kat's Writer's Workshop.--post about a woman who inspires you. A long time go I saw "The Marva Collins Way" on TV and was so impressed by her teaching style that I took notes and kept them in my purse! She taught school in Chicago and became frustrated with the school system, so opened her own school which became successful. Here is the list of notes I took from watching the movie which I try to apply when teaching Sunday School where applicable. Give praise and positive reinforcement. Always keep things fresh even if you taught the material before. No homework = no grade. Give short homework assignments every day. Give personal attention--say something nice before correcting errors. Don't give up--every child will learn in this class. Last week we took both our cats to the vet. We went to Banfield's because (1) it is close by; (2) we had a coupon for a free exam and (3) it is less expensive than Bartels. I was very pleased with the thoroughness of the exam and the technician and doctor were both friendly and liked cats. Manny is the cautious, tentative cat in our house. He is a big scaredy cat. It is always a task to get Manny into the carrier but with Gerard's help, this time we managed to do it. He had to get a distemper shot. I thought he was due for a rabies shot too but that's not until next year. He was so scared. I was surprised to learn he was overweight. I knew he was solid and pretty heavy. He weighed in at a whopping 15 pounds! Manny needs to go for a teeth cleaning this Saturday. I am nervous about this because they put him out for it and keep him there the whole day! I am going to miss my big guy. I sure hope he comes through it all right. They say it's important to do it because he has quite a bit of tartar built up. Spunky Doodle, however, couldn't wait to go when it was her turn. I just open the gate to the carrier and she walks right in. Spunky Doodle was all curious and quickly left the carrier to explore the room. She just had to inspect everything. I wish I could understand what she was meowing about because she seldom meows. She makes other noises, but not like that. You can hear her clearly on the video. She actually gained weight since her last visit and is now up to 14.8 pounds--almost as heavy as Manny. I was very surprised at this! It seems we are overfeeding all our pets. Even Abby has gained some weight back. She is at 45 pounds now and should be 35 according to the vet. I think that would be too thin though. I will just put out less food for the cats and give Abby a little less for breakfast. 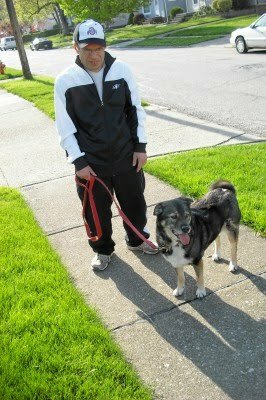 I will also make time each day to play with Manny and Spunky so they get some more exercise. The vet said overweight cats are more prone to get Diabetes and other health problems so they have to eat less and start moving more. Who do you think will lose the most by Halloween? Abby, Spunky Doodle or Manny? If we can get Manny weighed, we'll let you know how they're doing. Do you take your pets for regular vet care? Ever had them put out for a teeth cleaning? I sure could use some reassurance about this! 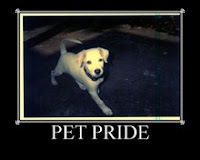 This is part of Saturday Samplings--best posts of the week and Pet Pride--visit for more pet posts or link up yours. Over at SITS there is a giveaway going on in connection with "Back To Blogging." The giveaway is a washer and dryer from sponsors, Standards of Excellence, Westar Kitchen and Bath, and Florida Builder Appliances. 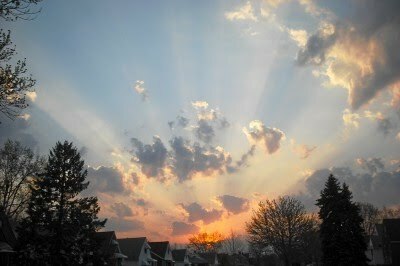 Day 1 of "Back To Blogging" is to repost your first blog post you ever wrote with your thoughts about it, so here is mine that was originally posted 2/23/08 on http://karen.pnn.com. 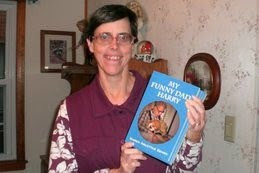 I just wrote my first book last year about my dad and me right after he died called My Funny Dad, Harry. I am married to Gerard, a wonderful husband, and have a cat, Spunky Doodle. I love teaching a 5th grade boys Sunday School class and am on the puppet team at Parma Heights Baptist Church. I like playing tennis, bowling, watching sports on TV, playing games on www.pogo.com, participating in forums on My Space (www.myspace.com/kzemek), Shelfari (www.shelfari.com/kzemek), Goodreads (www.goodreads.com) and obviously judging by my book shelf on here, reading. I also like taking pictures and have some posted on viewbug.com and photobucket.com. Sometimes I sell items on eBay. I never planned to become an author, but here I am! Please be kind. I just wrote My Funny Dad, Harry as a memorial to my dad after he died this past February. I just had so many thoughts about him racing through my head at night that I couldn't sleep, so decided to write about him. I realized what a wonderful dad he really was and how amazing as well as funny. Growing up, I always thought my parents were funny (as do most kids, I expect), and often said they should have a TV comedy show called the "Mom and Pop" show. A JESUS film team in Nigeria received permission to show the JESUS film at Osupa. A huge crowd of more than 2,000 people came to watch the film from both sides of the road. As the film progressed, suddenly people began running in all directions. In the darkness, the team couldn’t figure out what was going on, but the commotion was caused by an out-of-control bus speeding straight toward the film site. The people looked aghast at the rapidly approaching headlights! Everything seemed hopeless. Apparently the driver was drunk and lost control of the bus. The film equipment, the team, and hundreds of men, women and children stood directly in its path. How the large vehicle missed the crowd remains a mystery to this day. Workers said it was as though an unseen hand took control of the bus and moved it to the side, sparing the live of not only the audience, but also the driver. Ironically, the bus driver’s father was the man who allowed the use of this area to show the film. From The Power of Jesus used by permission from the Jesus Film Project®. This reminds me of a time me and my friend were riding bikes in our driveway. My dad’s car was parked in the drive. I went down the drive between the house and the car at the same time my friend came up the drive between the house and the car. I was sure we were going to ram head on into each other and closed my eyes waiting for the crash, but it never came! Somehow we passed each other without hitting or either of us falling. It was a very narrow space and at that time, bikes were big and clunky. Can you think of a time when the only explanation you didn’t get hurt or in an accident was God’s protection? 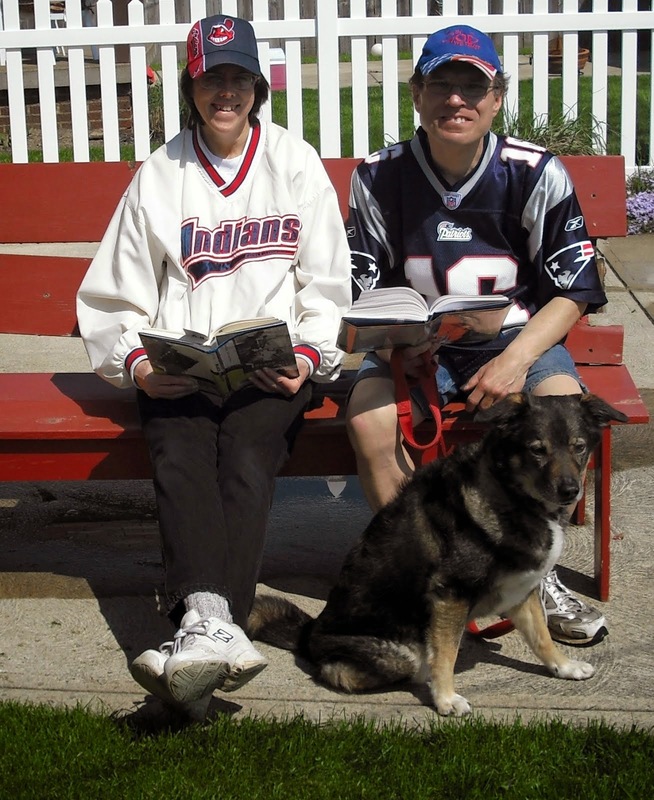 We were happy to see the start of NFL football today and enjoyed watching the Patriots and Browns games. 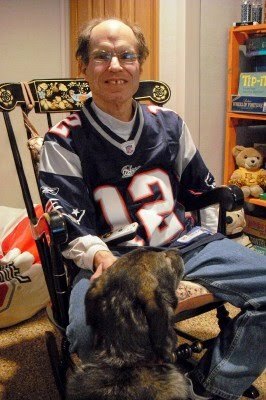 Gerard watched the Patriots game in the basement and I watched the Browns game upstairs with Abby and Manny. (Spunky Doodle is not interested in football and chose to snooze in the quiet of the den. It was a good opening day win! I am very happy. The offense, defense, special teams all score! Brady looks good and did not seem to be affected by the car accident he was in at all--thank God! Young defense was good and bad, but they will learn. The best news is nobody got hurt. Now it's on to the Jets next week. Should be a good one! It was good to see Wes Welker back from his knee injury! 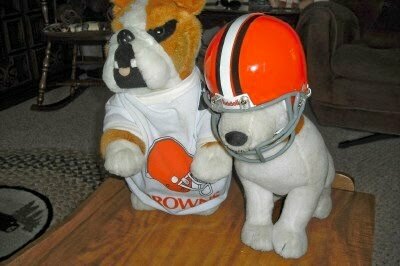 I was so excited to watch the Browns game today and they looked good for most of the first half. They led 14-3 until the last couple minutes of the first half when Delhomme threw an interception that the Buccaneers scored a TD on. All the momentum went to them then. The thing was, it was a bad decision to even throw the ball on that play in the first place. Delhomme hurt his foot and was limping off the field. At least they were still ahead 14-10 at the beginning of the second half, but it went downhill from there. I was surprised Delhomme played the second half with his hurt foot. The Buccaneers had no trouble at all running the ball and making more interceptions. I was once again disappointed. The Lions Should Have Won! We flipped over to see the end of the Lions game. With just a few minutes left, they were trying to come from behind and one of the receivers made a great catch in the end zone. Unfortunately, it was reviewed and determined that it was NOT a touchdown. They showed the replay again and again and it certainly looked like a touchdown to us! Even the announcers couldn't tell us why it wasn't a touchdown, or at least we never heard the explanation. All they said was something about a rule that should be changed but we didn't hear what the rule was. Does anyone know? Our sympathy to all the Detroit Lions fans! The good news is we were not in any football pool this week so did not lose any money--yea! It was a nice day out so after the game, we took Abby for a walk and I put on some relaxing music to help me calm down enough to write this post. I really expected the Browns would start off this season with a win. More bad news is that Pittsburgh won yet. When I first heard about a Pastor in Florida planning to burn the Qur'an today I was shocked and angry. I haven't heard if he went through with it or not, but I certainly hope he did not. I obviously am not Muslim but certainly people have the freedom to believe whatever religion they want without being persecuted for it. To purposely stir things up by burning the Qur'an serves no good purpose but wcould likely put a lot of lives at risk. This kind of foolishness by a Pastor is what gives Christianity a bad name. This is why I was angry when I read about this. I discovered this video through Twitter yesterday and thought it was so good that I decided to post it here. I thought it was very well done and is a great reminder of what it means to be an American. When reading Dad at the Chalkboard I learned there is a Twitter group for dads called #DadsTalking. This was mentioned in the post he wrote on being a good husband which I found through Mrs 4444 Saturday Samplings. Just thought men may be interested in this. I love to see men actually care about being good husbands and good fathers! I discovered how to get your images crawled to show up on Google searches at Design It Chic. In your picture HTML code, there is the word alt. Right after it before the " mark you insert some text that describes your image. (alt="describe your picture here") How simple is that! This is why I have "Design It Chic" on my blogroll--so I am sure to see when she posts tips. You may want to add this one to yours too! I just started a Bible Study on Leadership Training at church and one of the key concepts this week was to look at problems or testing as opportunities that challenge leaders to demonstrate their potential and maturity. "Testing always precedes promotion." Source: Equip Leadership Training Part Two by John Maxwell. According to a poll of 761 votes on Paw Print Post that was printed in the Life section of USA TODAY on Sept. 7, 14% said If their significant other said, "Either the dog leaves or I do," they would get rid of the dog; 53% would get rid of their significant other instead of the dog (33% would work it out)! Our dog liked this! Gerard said we would work it out. The results of our poll over at Grab A Book From Our Stack revealed that out of 22 people, 16 were turned on to reading for pleasure by a parent. Stop by Friday Fragments to read more and link up yours. Here is a little fun quiz that I thought appropriate since school is starting again. Both Gerard and I got the same result. Feel free to share your results in the comments or comment on any of the questions here. What was your favorite after school activity? Even I came out and after taking his picture, and sat on the ground next to the pool dangling my feet in and splashing some. 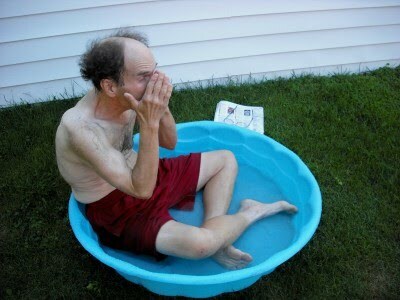 The water was cold at first, but it really felt good on such a HOT day. Thought this would give you a mid-week laugh. For all you fans of the country, this post is for you! Right in the middle of Parma, a suburb of Cleveland, Ohio is a 48-acre farm! It is just a little ways past Parmatown Mall right on a busy road, just 15 minutes from our home. It is operated by the Parma Area Historical Society. The Stearns house is circa 1855 and the Gibbs house was built in 1920. Both houses are operated as museums with furnishings appropriate to the era. 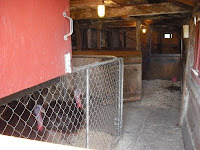 I didn't go inside the barn so didn't get to see the rabbits. Sometimes it may seem that God only did miracles in Bible times, but He is still in the miracle business today! As I read The Power of Jesus I was amazed at some of the modern-day miracles reported by The Jesus Film Project. I bought these booklets for the boys in my Sunday School class and will also share some of the miracles with you here on Mondays with the permission of The Jesus Film Project. I wonder why we don’t hear about these kinds of things in the news! Transporting the Yao JESUS films and equipment from South Africa for an evangelistic campaign was not easy. A group of 35 Christians and vehicles loaded with supplies for a 20-day journey and outreach traveled bush roads in terrible condition. They found that all the bridges had been either washed away or blown up during previous years of civil war, replaced with makeshift piles of sticks, twigs, and rocks. Even in four-wheel drive vehicles, crossing those bridges was risky and frightening. The passengers got out to help guide the loaded cars and vans as they inched their way over. At any moment, one of the vehicles could have lost its traction and tumbled off. In comments to our Anniversary post, Sandee left us the anniversary song. She included cute little notes so I asked her how she did that and here's what she sent me: & # 9834 ; Now take out all the spaces and you have a note. I will try it: ♪ Yup, it works! I earned my first money blogging this month from the Amazon Associate program. A whopping 52 cents! If you are looking to purchase a book from Amazon, I'd appreciate it very much if you check out the Amazon ads on our blogs and click through from them if you see something you like. Hey, it's at least something. I don't actually get it yet. It has to reach a certain amount which I don't even remember what it is anymore. Fortunately, I have a job and do not have to rely on making money through blogging! 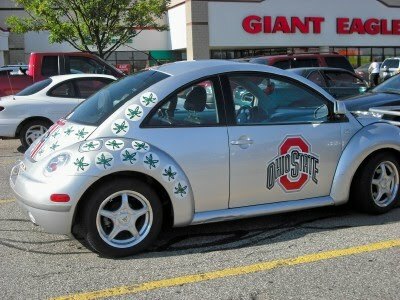 Meet The Owner of The OSU Beetle--A True Ohio State Buckeye Fan! The car is kind of football season car for me. I got the car from a guy in NJ five years back. I had a company in Mentor do the art work. I took them some actual helmet decals and a mini replica football helmet and asked them to make the car look like it. We love your car! It looks great! Did you attend Oho State? I did not attend OHIO STATE just grew up in Columbus where dad was taking us to the games since we were old enough to walk. Dad went there in the 70's and made us loyal to the Buckeyes early on. Wow, your dad did a great job raising a Buckeye Fan. We would like to get to at least one game! 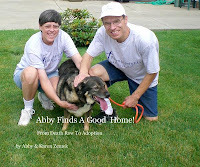 One Dog At A Time by Pen Farthing is about a true hero. This is an outstanding true story of Pen Farthing, a royal marine serving in Afghanistan. One day he came upon a stray dog and just knew he had to do something to help that dog. I really enjoyed this book A LOT. This is a page turner that I did not want to put down. I got into it quick and stayed to the end. WOW! Just Take My Heart by Mary Higgins Clark is full of suspense and true-to-life characters. It’s a murder mystery because although the husband, Greg Aldrich, is on trial for killing his wife, Natalie, he claims he didn’t do it. It is a high profile case that is discussed every evening on the show, “Courtside” which is hosted by Greg’s best friend. Emily, the prosecuting attorney, goes after a conviction even though she has some doubt about the defendant’s guilt. She has a soft spot for him when she sees his mother-in-law and his daughter and discovers there may be some tampering of the evidence in her case. As if that’s not enough, Emily is in danger herself when a serial killer moves in next door to her and stalks her. Emily’s husband was killed in Iraq and she never remarried so lives alone with her dog, Bess. I found parts even humorous when the serial killer loved to watch the show, “Fugitive Hunt” to see if he was featured. I loved how Emily discovers the truth and the surprise twist at the end, although the ending seemed very abrupt. There is so much more I’d like to say, but don’t want to ruin it for you. Most of the book focuses on the trial and is not gory. I highly recommend this book to anyone who likes suspense and murder mysteries.